<<< I grew up with this icon not far from my house. I remember those anthropomorphic dawgs used to rattle my sensibilities when I was a child because they looked the same on both sides. No backs, two faces. Twice as creepy. The dawgs have been repainted since the days of my youth. This past Saturday my husband and I stopped at a crossroads hot dog stand, a locally famous little place with usually long lines and lots of ear-splitting road noise. There I discovered July is not only National Ice Cream Month as I posted the other day, it’s also National Hot Dog Month. 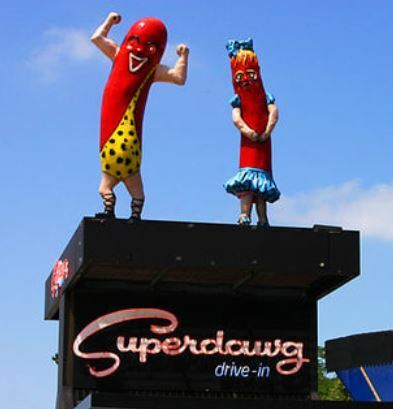 To add to this festive month-long wiener-rama, today is National Chili Dog Day. In 2005, the National Sausage and Hot Dog Council took a poll and discovered that chili was the third most popular hot dog condiment. The first was ketchup. Ketchup! Where I’m from, ketchup on a hot dog is almost a sin. Chili isn’t even mentioned. According to urban lore, the Chicago-style red hot came to be in 1929 in an open market area known as Maxwell St. There was a little sausage stand named Fluky’s there that offered a 5⊄ Depression Sandwich — a wiener with all the toppings mentioned above. I no longer live in Chicago so I don’t know if they’re still down on Maxwell St. But they’re still selling their famous hot dogs in Fluky shops here and there. When I was a kid they were bright carcinogen red. That dye had to be pretty darn toxic for it to be removed in the 1960’s. We were still using DDT at the time and didn’t give that a second thought. Franks, frankfurters, sausage, wieners, wienies, wursts, hot dogs, red hots, and all the other hot dog nicknames out there, a dog is essentially a sausage of finely minced meats. In general, wursts are just sausages — an economical way to use scrap meats. (I just had a flash of memory regarding the “true” content of hot dogs. The comedy is called The Great Outdoors) In our years living at an open-air summer camp, turkey dogs were on the lunch menu at least once a week. They were gritty. You don’t want to think too long on why your hot dog is gritty. We used to joke about them being 100% turkey dogs. 100% meaning feathers, beaks etc. Ugh. Now there’s a jaunt down memory lane. Anyway…Beyond the combinations of meats and seasonings that create those distinctive flavors, the names we associate with them have to do with their place of origin. The frankfurter, or frank, for example, is a pork-based sausage that comes from Frankfurt, Germany. Wieners come from Vienna Austria. (Pronounce that w like a v). In my neck of the woods, the Vienna Beef and David Berg all-beef Vienna hot dogs wear the crown. Early hotdogs in America didn’t come on a bun. Some credit New York’s Coney Island for that merger in the 1870’s. I saw another reference that said the hot dog bun combo came to be in 1880’s St. Louis, Missouri. The latter sausage seller was handing out a glove you could hold your sausage with but after a while that proved too expensive to keep up. It was his wife who came up with the brilliant idea of selling their wieners on rolls. Another version of that tale has this taking place during the World’s Columbian Exposition in Chicago in1893. The vendor ran out of gloves because people were keeping them as souvenirs. Wiener glove mementos?? The most beloved bit of hot dog trivia has the hot dog name beginning with a newspaper cartoon. A vendor was calling his sausages dachshund sandwiches and the cartoonist couldn’t spell dachshund but knew what wiener dogs were. He named those sausages on a roll hot dogs. I was hoping to find the PBS special entitled A Hot Dog Program on youtube. There are individual clips of the documentary there if you wish to look for yourself, but not the entire program. As the name suggests, it’s all about the hot dog around the USA. You wouldn’t think regional dressings of hot dogs would make an interesting hour, but if it ever comes to your local PBS station, I recommend it. It’s a fun take on a beloved food icon. The dog may have started out as a humble European sausage, but we’ve made it our own with our occasionally weird toppings. Every year, Nathan’s Famous in New York has a hot dog eating contest. I imagine the winner’s liver takes a real beating trying to process the barrage of fat, salt, and nitrates. There are 57 entries to come. Romance Books ‘4’ Us ~ a new contest starting soon. 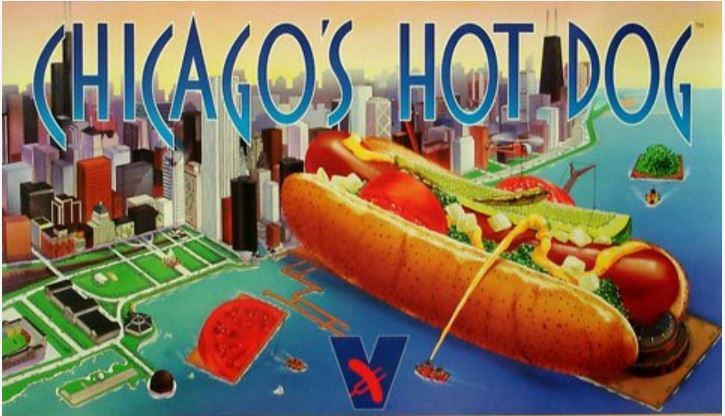 This entry was posted in Past Posts - you'll never know what you'll find and tagged Chicago red hot, dachshund sandwiches, hot dog, National Chili Dog Day, PBS special: A Hot Dog Program, Romance, Rose Anderson, World's Columbian Exposition. Bookmark the permalink. 4 Responses to Dachshund sandwiches? The funniest remark I ever saw about hot dogs was by George in Coming Up for Air. A story about men all wearing the same suit, carrying the same briefcase coming out of houses that looked the same to go to work. The men would eat sausages that tasted like tuna fish in rubber tubing. My favorite condiments are mustard and diced onions. Now there’s an image. lol Tuna in rubber tubing sounds like my view on calamari. I don’t have a favorite hot dog topping. I vary them. Ketchup! *gasp* . I admit to liking grilled hotdogs with a slit on the middle and American cheese backed inside. The wrap that in bacon. A francheesie.